Historically, public education has played a key role in growing the middle class and ensuring that all children, regardless of their backgrounds, have an opportunity to achieve at high levels. Unfortunately, the nation’s current school finance system—primarily based on local property taxes in many places—exacerbates rather than ameliorates resource disparities between high- and low-income communities. With income inequality continuing to rise and wealth becoming increasingly concentrated at the top of the income distribution, it is more critical than ever for districts, states, and the federal government to take seriously their responsibility to provide an excellent education for all students. Fifty years ago, Congress passed the Elementary and Secondary Education Act, or ESEA, to address disparities by providing Title I federal funding to schools that serve students from economically disadvantaged backgrounds. But the law has not achieved its intended effect of ensuring that federal dollars enhance local investments in education. In 23 states, high-poverty districts spend fewer dollars per student than low-poverty districts. In Pennsylvania, for example, the highest-poverty districts spend more than 30 percent less per student than the lowest-poverty ones. In more than half of the states, there are hundreds of high-poverty schools that receive less funding than schools that serve more-affluent students. Congress passed the most recent ESEA reauthorization, known as the No Child Left Behind Act, or NCLB, in 2001, and it is now eight years overdue for an update. While many students, particularly students of color and economically disadvantaged students, made progress under the NCLB, the law nevertheless needs to be improved to better serve all students. In particular, ESEA reauthorization provides an opportunity for Congress to consider fresh ideas that would support states and districts in increasing school funding equity so that students in low-income communities receive the resources they need to achieve at high levels. 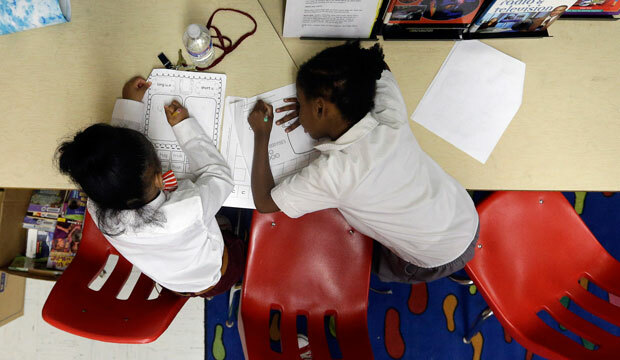 For years, the Center for American Progress has called on Congress to improve fiscal equity by closing the “comparability loophole,” which allows local school districts to underinvest in their low-income schools. CAP has also pushed for improvements to the ESEA Title I formula—which determines how Title I funds are allocated—and better targeting of funds to the most needy districts, as well as the implementation weighted student funding formulas in order to provide more resources to schools and districts that serve disadvantaged students. While all of these policies remain valuable—and Congress should implement them—fresh thinking is also needed to achieve the goal of greater equity in resources. As part of ESEA reauthorization, Congress should consider new ideas to address inequities in education funding across and within districts, as well as other measures to improve school financing. These five proposals are discussed in greater depth in the remainder of this issue brief. President Barack Obama’s budget for fiscal year 2016 requested an additional $1 billion for Title I in order to provide additional resources to states and districts that would support implementation of key reform efforts. These new resources are sorely needed, but they should be specifically targeted to help states move toward progressive funding systems that would close the resource gaps between high- and low-income districts that have been created by inequitable state school finance systems. CAP’s proposal would make the $1 billion available in new funding under Title I for Fair Funding Incentive Grants to be distributed to states; states would then distribute the funds to districts via the existing Title I formula. The grants would provide additional administrative funds for states to develop and implement progressive funding systems. To be eligible to receive a grant under this new funding stream, states would need to commit to match their grant amount with state funds that are directed at inequitably funded low-income districts in order to close across-district funding gaps. This match requirement would be waived for states that can demonstrate that all low-income districts spend more state and local funds than all high-income districts. All states would be required to either continue to match the grant amount with state funds on an annual basis or implement fully progressive funding systems that provide more resources to low-income districts than high-income districts. If this requirement were not met, the state would lose access to the additional funding. States would also publicly report on gaps in actual expenditures between high- and low-income districts and disclose whether these gaps are closing. In addition to receiving a Fair Funding Incentive Grant, states that do not yet have progressive funding systems but commit to develop and implement such systems within five years would receive the authority to reserve an additional 1 percent of their total Title I funding for state-level activities to support these systems. These states would need to demonstrate progress toward increasing funding equity in order to continue to receive these additional funds. Providing additional resources for low-income schools through an increase in the Title I program would be a good step for Congress to take toward ensuring that disadvantaged students have the supplemental resources they need to achieve at high levels. However, using these additional resources to create incentives for states to contribute additional state funds toward the goal of equitably funding their low-income districts would make these federal resources even more effective. Title I’s goal is to provide additional resources to schools that serve high concentrations of students from low-income families and to support improved outcomes for the lowest-achieving students. For this aim to be realized, states and districts must make sure that low-income districts and schools receive their fair share of state and local resources, and Title I includes several provisions intended to address this issue. However, demonstrating compliance with these federal fiscal requirements—for example, comparability, in which districts must show that they provide “comparable services” in high and low poverty schools through state and local dollars—as well as the specific rules that govern each federal program, can introduce unnecessary burdens that distract from the overall goal of providing additional support to low-income schools and disadvantaged students. Therefore, states’ compliance burden should be streamlined and reduced if they achieve the spirit of Title I. Under this proposal, if a state can demonstrate that its state and local funding is progressive—that low-income districts and schools receive more state and local funding per student than high-income districts and schools—then it would not need to meet a “maintenance of effort” requirement. Under maintenance of effort, districts cannot substantially cut their spending of state and local dollars from year to year. The current maintenance of effort level is 90 percent of the prior year’s funding, so there is already a significant allowance for reductions in funding. This proposal would ensure that any reductions in funding are distributed equitably across the state, not concentrated in the highest-need districts and schools, creating an incentive to maintain spending across the state. Districts, meanwhile, also would not need to meet current comparability and supplement-not-supplant requirements, as funding schools progressively, by definition, means that higher-poverty schools receive more in state and local dollars than other schools. Under supplement not supplant, districts must fund the schools supported with federal dollars in the same way that they fund other schools not receiving that extra funding. If schools were funded progressively, places with high concentrations of poverty would receive more state and local dollars and therefore be in compliance with supplement not supplant. Requiring that districts only need to demonstrate progressivity would significantly reduce the compliance burden on districts. In addition to flexibility regarding compliance with these fiscal requirements, under this proposal, districts also would be permitted to transfer 100 percent of all ESEA formula funds—expanded from only Title I, Title II, and Title IV under current law—among those programs, with the exceptions that funds still could not be transferred out of Title I and districts would not need to comply with specific program requirements as long as they met the programs’ intent and purposes. This additional flexibility at the district level would encourage comprehensive and coordinated planning and reduce the compliance burden associated with all of the specific federal funding streams, while the state commitment to progressive funding would ensure that additional resources continue to be directed to the schools and students with the greatest need. For decades, Title I of ESEA has included important fiscal requirements to ensure that federal funding is supplemental to state and local education funding and that states and districts do not reduce their own spending in response to receiving federal dollars. All of these fiscal requirements are intended to provide protections for low-income districts, schools, and students. In practice, however, they can put a significant burden on state and local officials and lead to ineffective programmatic decisions based on ease of compliance with the requirements rather than students’ best interests. For situations in which states are not progressively funding their districts and schools, these requirements are important safeguards to protect disadvantaged students. However, if a state can demonstrate that it is ensuring that its high-poverty districts and schools receive more state and local funding than its low-poverty districts and schools, the federal funding is supplemental by definition, and the state is meeting the intent of these key fiscal requirements. Some states do better than others at helping disadvantaged districts get the money that they need, but many states still have school funding schemes that actually worsen the problem. To remedy this, as part of their applications for Title I funds, states should demonstrate how they are ensuring that districts serving the most disadvantaged students have the additional resources they need. Specifically, in their Title I applications, CAP recommends that states should be required to demonstrate fiscal progressivity using a reputable measure, such as the one included in “Is School Funding Fair? A National Report Card.” The measure would show that school districts with high concentrations of students from low-income families receive more state and local revenue than districts with low concentrations of students from low-income families. States that are not able to demonstrate this would need to provide a plan for implementing a fair funding system within three years. Following the initial demonstration, states would then annually certify that they are continuing to implement their progressive funding system. A state could also show that it has a progressive funding system by using other well-respected metrics of progressivity or more-programmatic metrics. These metrics could include demonstrating that the state provides the vast majority of funding to low-income schools and allocates significant additional funds for students who are low income, English language learners, or have special needs. For this indicator, CAP recommends relying on one year’s worth of data, which would be more sensitive to policy changes. Under this proposal, the U.S. Department of Education would review the indicators of fiscal progressivity that states submit as part of their applications for Title I funds. States that fail to show within three years that their distributions of state and local education dollars were demonstrably progressive—as defined above—would lose their Title I administration dollars. The recaptured funds would then be distributed directly to high-need school districts based on the Title I formula. In addition, there must be a “hold-harmless” provision to ensure that states do not cut funding from one district to pay another. In other words, states cannot simply drop spending levels in their higher-spending districts. School funding is a necessary condition of a high-quality education. Despite this, investments in education vary wildly across the country, and many states and districts fail to provide enough money to meet this minimum threshold. In the 2011-12 school year, for instance, some 300 school districts spent less than $7,500 per student after adjusting for cost of living and student needs. In unadjusted figures, these low-spending districts generally spend between $5,351 and $8,233; on average, they spend around $7,130 per student. For a number of reasons—ranging from weak funding systems to tax cuts—some states have not demonstrated that they provide all of their districts and schools with an adequate amount of school funding. As a result, there is a role for federal government to set clear expectations for school funding via a minimum spending threshold for districts to be eligible to receive Title I funds. CAP recommends that the federal government establish a national per-pupil spending minimum of $7,500 per student after adjusting for differences in cost of living. Even after making cost-of-living adjustments, $7,500 per pupil annually is a minimal amount to spend on a child’s education. As a benchmark, this figure is clearly reasonable. A few years ago, some of the country’s leading experts in school finance estimated that to educate effectively, a district should spend at least $10,980 per pupil in 2012 inflation-adjusted dollars. In short, this minimum figure is thousands of dollars less than what some experts estimate, and it should therefore be a reasonable benchmark to identify only the districts with the most needs. The cost to provide an adequate education varies across states, but this amount is consistent with base funding levels established in several states. For example, in their state funding formulas for fiscal year 2015, North Dakota and Rhode Island each allocate districts at least around $9,000 per pupil. Using data from 2012—the most recent data available—CAP found that there were 19 states where at least one school district spent less than the $7,500 mark. Among these states, there were five—Arizona, California, Idaho, Texas, and Utah—where more than 10 percent of districts spent less than $7,500 per student, even after adjusting for cost of living. In Utah, almost 40 percent of school districts spent less than $7,500 per pupil, while 26 percent of districts in California spent below the threshold. Many of these low-spending districts are rural, but some are in suburban or urban areas, such as Cypress-Fairbanks Independent School District on the outskirts of Houston and Burbank Unified School District outside Los Angeles. Nevertheless, it is important to note that California’s new state education funding formula was enacted in the year after these data were released. Known as the Local Control Funding Formula, California’s approach would allocate each district around $7,600 per student, on average, almost certainly putting a great many of the state’s districts above the $7,500 threshold after adjusting for differences in cost of living. To address this issue, CAP recommends that all states with a district below the minimum threshold should have to provide a plan to ensure that all districts in the state meet this threshold within three years. States would have an opportunity to request a waiver of the minimum threshold from the secretary of education if they could show that their districts had sufficient funding to meet the needs of all students. This waiver authority is important, since CAP’S adjustments for cost of living might not adequately adjust for all differences in cost. Under this proposal, the secretary also would have the ability to adjust the minimum threshold, given changes in economic conditions. The U.S. Department of Education would review and approve these plans. If a state could not demonstrate that all of its districts were meeting the minimum-spending threshold after three years, the state would forfeit its Title I administration funds. The recaptured funds would then be distributed directly to high-need school districts based on the Title I formula. This proposal would require a significant increased investment in public education in many districts. By establishing this spending floor, however, the federal government would make clear the expectation that all districts, regardless of their demographics, have enough resources to provide all children with a high-quality education. School dollars are not always spent in ways that help students. Some school systems overspend their funding due to outdated governance structures; others invest in weak programs or practices. The federal government can do far more to help states and districts and give them dedicated support to improve fiscal outcomes. Virginia has been a leader in this space, and in a program started under then-Gov. Mark Warner (D), the state has provided technical support to districts that helps them spend their school dollars more wisely through fiscal assistance teams. Specifically, CAP recommends that fiscal assistance teams should be an explicitly allowable use of the funds currently available for state administration and for supporting low-performing schools under Title I. In other words, state-level Title I funds should be allowed to pay for technical assistance teams that provide fiscal support, which includes but is not limited to evaluating key operational functions, such as budgets, staffing, and administration. The state would provide a recommended list of outside vendors that districts could use; districts would be required to help pay for some portion of the program out of their own budgets. While such uses of Title I funds might be allowable in certain circumstances under current law, this proposal would include amending the ESEA to ensure that this specific use of funds is permitted. By encouraging states to use their funds for this purpose—and making it explicitly allowable under Title I—this proposal would create incentives to reduce inefficiencies in the spending of federal, state, and local dollars. More importantly, the policy effort would increase the real dollars available to support students without an increase in overall spending, and these dollars would be available to increase services targeted toward low-income schools that improve outcomes for low-achieving students. The Elementary and Secondary Education Act’s original purpose was to improve the education of disadvantaged students and to ensure that the schools and districts that serve these students had additional resources to meet their needs. Unfortunately, fiscal inequities continue to persist, with low-income districts and schools receiving less funding than their higher-income counterparts. It has now been nearly 14 years since the law has been reauthorized, and Congress should consider fresh ideas for supporting states and districts in equitably funding their low-income schools. If Congress fails to remedy funding problems now, an entire generation of students may miss out on fair and effective funding. Focusing ESEA on funding issues should be a key priority in any reauthorization discussion moving forward.